Benefortin There are 3 products. 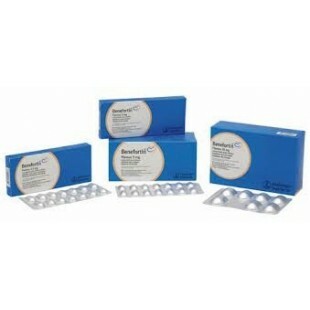 Benefortin are brownish oval tablets manufactured by Boehringer Ingleheim. Each Benefortin tablet contains either 2.5mg, 5mg or 20 mg benazepril hydrochloride. After oral administration Benefortin is rapidly absorbed from the gastrointestinal tract and hydrolysed into benazeprilat a highly specific and potent inhibitor of angiotensin converting enzyme (ACE). Benazeprilat produces significant inhibition of plasma ACE activity for more than 24 hours after a single dose in both dogs and cats. Inhibition of ACE leads to a reduced conversion of inactive angiotensin I into angiotensin II and therefore reduction in the effects mediated by angiotensin II including vasoconstriction of both arteries and veins retention of sodium and water by the kidney and remodelling effects (including pathological cardiac hypertrophy and degenerative renal changes). What is Benefortin used for? Benefortin is indicated for the treatment of congestive heart failure in dogs and the treatment of chronic renal insufficiency in cats. In dogs with heart failure Benefortin lowers the blood pressure and volume loading effect on the heart. In cats with renal insufficiency Benefortin reduces the protein loss in urine and normalises the elevated glomerular capillary pressure and reduces systemic blood pressure. Reduction in glomerular hypertension retards the progression of kidney disease by inhibition of further damage to the kidneys. Benefortin has been shown to increase the appetite quality of life and the survival time of cats particularly in advanced disease. Congestive heart failure in dogs is a chronic condition caused by heart disease, which often progresses very slowly and may take several years to become apparent. Congestive heart failure occurs when the heart of the dog has trouble pumping blood around the body, and may affect one side of the heart only, or both sides simultaneously. A diagnosis of heart problems in your dog can of course be very worrying for the owner, however, while congestive heart failure cannot be cured or reversed, with veterinary treatment, many dogs can live happily for many years after diagnosis. In some cases, affected dogs can reach a grand old age in otherwise good health. Getting to the root of the heart condition that ultimately leads to congestive heart failure is not always possible, and the fact that there is a problem at all may not become apparent for many years. There are a wide range of potential causes of congestive heart failure, including heart defects that are present from birth, a hereditary predisposition to heart problems, heartworm, infections, injuries, and simple old age. Certain breeds of dog such as the Boxer tend to have an elevated occurrence rate of heart problems, and as such, may have a breed-specific predisposition to the problem. • Rapid, shallow breathing when at rest. • A persistent, soft cough, particularly during exertion. • Reluctance to exercise and play. • Pacing, circling or otherwise taking a long time to settle down to sleep. • Weight loss for no obvious reason. • Swollen paws on all four legs. • A grey or blueish colour to the gums. If you spot any of the above symptoms or otherwise have cause for concern about your dog’s heart health, it is important to speak to your vet as soon as possible in order to get a firm diagnosis. Your vet will look at your dog’s full clinical history, and talk to you in detail about your dog’s lifestyle, and the symptoms that you have noticed. • Blood and urine panels to rule out any other problems. What can be done for congestive heart failure in the dog? • Medications such as Fortekor, Enacard or Benefortin to help the heart to function normally and regulate irregular heartbeats. • Medications such as Corvental-D to help to support the heart, and resolve the fluid build-up in the lungs that can accompany the condition. • Surgery to repair torn heart valves or to place a pacemaker to regulate the heartbeat. • A special prescription diet such as Hill’s H/D to reduce fluid build-up in the body. • A special exercise and weight management regime to help to keep your dog at a healthy weight while avoiding placing additional strain on the heart. Congestive heart failure cannot be reversed or cured, but by following your vet’s guidelines on the appropriate medications for your dog and any changes needed to their lifestyle, you should be able to keep your dog in otherwise good health, support their heart function, and prolong their healthy lifespan. Obesity and weight problems can place additional strain on the heart and worsen the condition, and so it is important to keep your pet fit and healthy while also ensuring that they do not overexert themselves, placing further strain on their already compromised heart functions. Once your dog has been diagnosed and treatment has begun, your vet will usually need to see your dog on a regular basis to monitor the progression of the condition and how effective their treatment protocol is proving to be, but generally, treatment for heart failure is performed on an outpatient basis at your local clinic. Can congestive heart failure in the dog be prevented? Heart problems that are present from birth or that have a hereditary element to them cannot be prevented, but in some cases, early surgical correction of known problems can repair the heart and keep later problems from developing. Keeping your dog fit, healthy and at a suitable weight can all help to support lifelong heath too, as can ensuring that your dog stays up to date with their vaccinations, and is wormed regularly in accordance with your vet’s guidelines.